All aboard the book train. The electric "book train" runs on rails between storage below Bryant Park and the first and third floors of the Stephen A. Schwarzman Building, according to a statement from the NYPL. The train's 24 red cars can move both horizontally and vertically — like the glass elevators in "Charlie and the Chocolate Factory" — and seamlessly transition between the two, as seen in the video below. Pivoting gray baskets in the cars keep their contents upright. 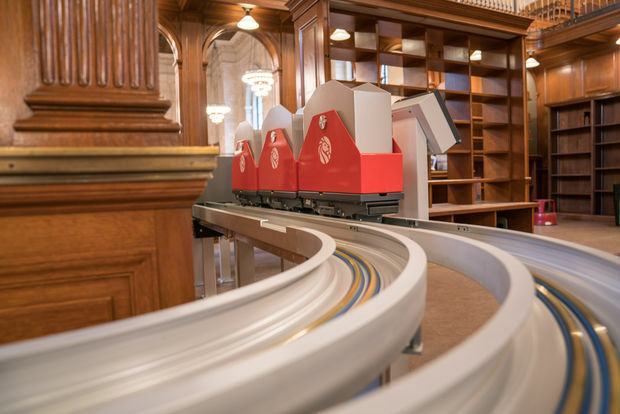 The train travels at the speed of 75 feet per minute, which means a trip from the two-level underground stacks to the soon-to-be-reopened Rose Main Reading Room on the third floor takes five minutes. Each car can carry up to 30 pounds of books along 950 feet of track. They won’t, however, convey special collections items, like rare books, manuscripts and maps. Those will still be handled by staff. “In other words, the Declaration of Independence won't be placed on the conveyor,” NYPL spokesperson Angela Montefinise said in an email. The new book transportation system, developed by a company called Teledynamics and installed by the design firm Gensler, cost roughly $2.6 million. It replaces an older, dowdier model that transported boxes on conveyor belts. The book train starts chugging along the week of Oct. 3.